I hate it when athletes age and lose their dominance. It happens to everyone, from Michael Jordan to Wayne Gretzky, and it's a cruel reminder that youth is fleeting. I cringe when I look at New York Mets boxscores because Carlos Delgado is ageing rapidly. He's batting .210 right now, with 3 home runs and 13 RBIs. Those aren't Delgado numbers, and I hear Mets fans boo whenever he makes an out. They sense the end is near and they're looking for blood. Delgado was an awesome Blue Jay. His 336 homers as a Jay are 133 more than George Bell ever hit for Toronto. His 1058 RBIs are also a club record. In one of his final games as a Jay, I watched him hit one out. 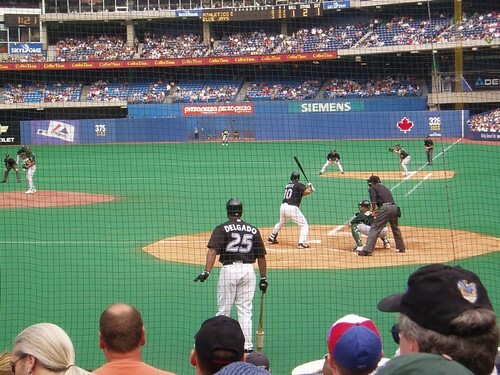 It was the first game my son ever attended and I made sure he knew how lucky he was to witness a Carlos Delgado bomb. He wasn't just deadly at the plate, he was also drenched in integrity. Who didn't love Carlos Delgado at first base for the Blue Jays? Soon, we'll just be left with the memories. Thankfully, Delgado will leave us with a tonne of 'em. Remember the milk commercials with Delgado? Right - when he was a catcher!